My Christmas Prayer For You | Kierra Raine and Co. I just wanted to share this verse with you….a few days before Christmas. This is intended to give you HOPE. This is my prayer for you. You who are facing life and it’s uncompromising hurts and HARD things. He has given to those He called. This is the same mighty power that raised Christ from the dead…who fills all things everywhere with Himself. Firmly embrace this day of light! And if today you are walking in the darkness of pain….know without a shadow of a doubt…as sure as the dawning sun…THE light WILL COME!!! Our daughter is not with us for this Christmas, but her happiness is unparalleled, I know. I just had to share this lovely gesture of kindness and care that wonderful friends gave us. 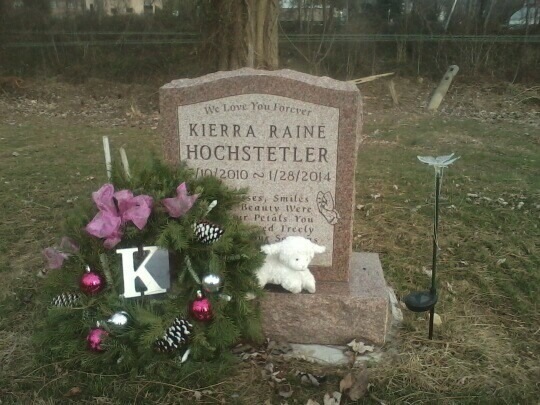 Since we can’t visit Kierra’s grave this year, they did it for us. I cried when I got this photo texted to me. The lovely wreath matches the one that was delivered to our front door last year. The shiny pink ornaments are SO Kierra! And that darling white K. I don’t know if they have any idea the good this did to my heart. There aren’t really words to describe how much it means when my sister stops in on a trip to PA to visit Kierra’s grave and leaves a poinsettia. When friends celebrate her life with this wonderful wreath. I ask God to bless them in a special way! A REALLY special way!! This is so encouraging/sad/sweet that it brought tears. Thanking of you so much during this season. Hugs.